It was time. We gallivanted up the southeast hill in Draper to Garage Grill, showroom of Salt Flats Brewing, where we planned to do something neither of us had done in quite awhile—purposefully order a Hefeweizen with our meal. We remember the Hefeweizen gaining a ton of traction back in the early to mid-’90s. This traditional German-style wheat beer is likely the first “cloudy” brew we can remember that wasn’t a filtration mistake. Like IPAs, as the style grew in popularity, brewmasters sought to build on a good thing by adding fruit to the mix. Apricot, blueberry and raspberry seemed to be popular. Unfortunately, somewhere along the way, these beers seemed to suffer a fate similar to the pilsner with craft beer–seekers, falling out of favor as big, bold hoppy beers took over. In recent times, our consumption of them is usually because they are in a mixed-style pack or part of a brewery’s standard sampler flight. Nonetheless, we went to Salt Flats Brewing and ordered up a tall pint of this often discounted craft brew for old times’ sake. The beer was served in a 16-ounce shaker glass, appropriately adorned with the label of the brewery. Our beer was also decorated with a wedge of lemon placed tightly on top of the glass. This may be one of the drawbacks in the modern craft beer world for this traditional style; among purists, it might be seen as a gimmick or unnecessary. We do not affiliate as purists, but we quickly tossed the citrus nugget to the side. The beer pours a lovely haze of lemon sunshine with a billowing, white head that lasted just long enough to grab a couple pictures. With the raise of the glass, a fresh whiff of lemon zest and fruity granola greets the nose. Now we don’t know for sure, but this is probably where the lemon wedge laid. Lightning flavors of banana and cloves up front with a sweet, bready finish from the wheat polish the palate. The mouthfeel is clean, full-bodied and perfect for summer. Overall, the experience is a pleasant one and has us questioning why we seemed to dismiss this classic style. 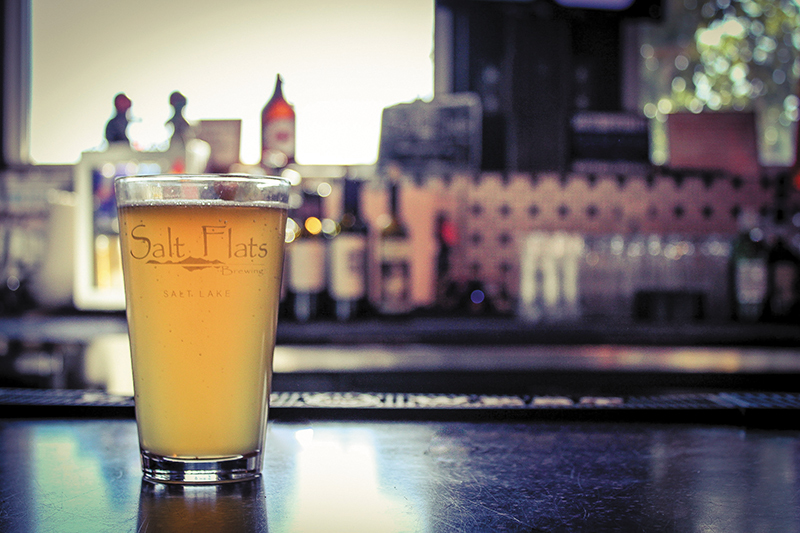 Salt Flats Hefeweizen is a reminder that it shouldn’t be overlooked if you’re in need for an easy-drinking fill-up. 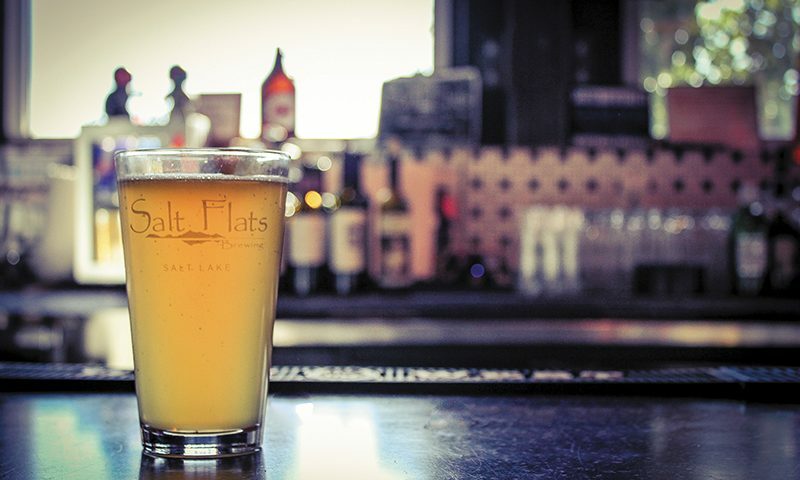 Salt Flats Brewing hit the asphalt revving by bringing tasty, refreshing beers to its customers. They base their purpose around celebrating the hardworking people (and cars) in the racing industry. Their name makes sense. “Salt Flats … Bonneville Salt Flats notable for racing …” You get the idea. So, though many of Salt Flats’ staple beers fall in line with what are generally considered safe beers, they are accomplishing exactly what they set out to do: allowing the “everyman” to last the entire race with their versions of session beers. SFB is keen by successfully avoiding a position as a field-filler and came to the starting line ready to be inducted into the 200 MPH Club. Along with Hefeweizen, SFB has anywhere from 15–20 beers on tap at Garage Grill, the only pub located in Draper, Utah. A few of their beers, including this one, are also located in some convenience stores around the valley. However, visiting the racecar-filled, motor lover’s dream pub guarantees immersion into their vision. Thanks for taking a trip with us back down craft beer–memory fast lane! Cheers!